BEFORE: After a wonderful Thanksgiving yesterday, and some impromptu Black Friday shopping Thursday night (they really need to come up with a new name for Black Friday), it’s time to head out to the theaters again to watch a much more patriotic and American film, Steven Spielberg’s Lincoln. I’ve been looking forward to this film for a while now and after not seeing either of Spielberg’s two films last year I’m looking to reconcile that. However I am a bit cautious about how good the film will be after seeing the trailers. Suffice it to say, I’m going in with lower expectations hoping to be proven wrong and confident I will be. AFTER: When you think of Steven Spielberg you think of big-budget, action-filled spectacles like Saving Private Ryan, E.T. the Extra-Terrestrial, or Jaws and look over more character-driven dramas that look at important issues (I would put Schindler’s List in this category even though it grossed over $300 million). 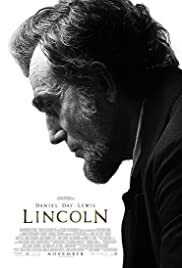 Lincoln is not a spectacle film, it’s a contemplative film that requires much more attention and there are many benefits and drawbacks to this kind of film. The main problem with the film is due to its nature. Lincoln is a biographical film. It focuses on Lincoln’s struggles trying to get the 13th Amendment (abolishment of slavery) passed in January 1865. That is a big uphill battle for Lincoln to fight because we all know the outcome; the Amendment passes (spoiler alert for anyone who’s been asleep for the last century and a half). One of the problems with Invictus yesterday was a lack of conflict; no driving force keeping things going in the film. Lincoln feels the same way for a large chunk of the film. Things just seem to happen as we jump from scene to scene without any feeling of purpose. On the flip side though this approach is better than the filmmakers creating conflict and inventing problems (like vampires for instance) but no matter how you spin it, it’s not as entertaining as films with that luxury. I will say however that there is a turning point in the film and that is Thaddeus Stevens’ (Tommy Lee Jones) speech in the House of Representatives in favor of the 13th Amendment. From this point on in the film, things just seem to click. A tension builds and even though you know what’s going to happen, the Amendment will pass, Spielberg is able to create some level of doubt as you begin to wonder how it passes after so many setbacks in the eleventh hour. So even despite the big obstacle to success, Lincoln does bring some excitement to 19th century America. But for me, the most important part of the film was not the story; it was the acting. Acting is where Lincoln excels and is helping propel its Oscar buzz to what appears to be a clean sweep for Lincoln at the moment. The most talked about performance has to by Daniel Day-Lewis’ who has the opportunity to play our nation’s 16th President, Abraham Lincoln. Simply put, Day-Lewis is Lincoln. From now on whenever I think of Lincoln, I’ll be thinking of Day-Lewis’ performance and interpretation of the President. Amongst an incredibly large ensemble cast, all of whom did an extraordinary job, Tommy Lee Jones’ depiction of the aforementioned Thaddeus Stevens stands out. Not only did he have the big cathartic speech that piqued my interest in the film, but you could tell he was a complicated man; not just someone who says slavery is bad, but someone who feels slavery is bad. With all the performances, I don’t know much about the actual people being represented. I know enough history that I recognized some names, but past that my knowledge is nonexistent. I have enough trust in Spielberg and everyone else involved that the characters shown are accurate representations of the actual people. As a result, from here on out, I will associate what I saw in Lincoln with the historic figures they represented. Much like Daniel Radcliffe is now Harry Potter to many people, Day-Lewis is now Lincoln and so on for the rest of the case. Lincoln already has a lot of Oscar buzz even before the Oscar season really hits its peak in December. Without a doubt Lincoln will receive nominations in the acting categories and most certainly the other major categories (Picture, Director) as well. And the film certainly has it’s merits. The acting is out of this world and is some of the best I’ve seen in years. But Lincoln will turn many people off because it’s not an action-packed blockbuster with explosions and chases. While it is obvious people appreciate complex and confusing films (Inception being the prime example) I’m not sure how accepting people are of films that have no action whatsoever and rely solely on the spoken word and the emotions in expressions as subtle as a shift in the eyes. While I enjoyed the film and appreciated Lincoln for what it is, it will never reach the level that Star Wars or Lord of the Rings has reached where I can watch it repeatedly, never getting bored of it and entertained throughout the entire film. But a film doesn’t need to reach that level to be a great film. Lincoln is a well-told historical drama that is also a great social commentary on today’s state of affairs in Washington. For people who this sounds intriguing, or not, I recommend you see it regardless. Either way, I guarantee you’ll learn something new and even if you don’t like it, at least you’ll have given something different a chance. Because if you just watch the same movies over and over again, you’ll never grow and learn new things which is just part of the reason for this marathon.